Nier Automata has online elements, but PC players are gonna have to wait to experience them. Nier Automata developer Platinum Games has been deliberately quiet about the action RPG’s online elements, but a recent livestream has made it a bit less mysterious. As Alex reported from a recent interview and hands-on, Nier Automata features an Android system where players can return to the scene of their deaths to recruit their corpse as a time-limited NPC or retrieve lost items like plug-in chips.. According to Gematsu‘s recap of the livestream, you’ll lose that chance if you die again before reaching your corpse – or if you take too long to get there. In that way, Nier Automata puts a little spin on a system seen in like Dark Souls, Lords of the Fallen and Nioh. As in these other games, your corpse in Nier Automata may be visible in other players’ worlds if you’re both playing online, and the livestream confirmed that you can also resurrect strangers’ corpses to fight alongside you. The livestream deliberately glossed over what happens if you try to retrieve lost items from another player’s corpse instead, and there’s still no word on the haiku you can leave beside your corpse – another Nier Automata spin on the increasingly popular messaging system of Souls-like games. Elsewhere in the livestream, the development team confirmed Square Enix had agreed to fund Nier Automata DLC, but it’s not yet decided what form it will take – costumes, maybe. Also, a couple of Nier Automata PS4 themes will be released for free on the Japanese PSN from February 22. let’s hope they come west, too. The livestream also gave an update on the PC port of Nier Automata, which does not have a release date. 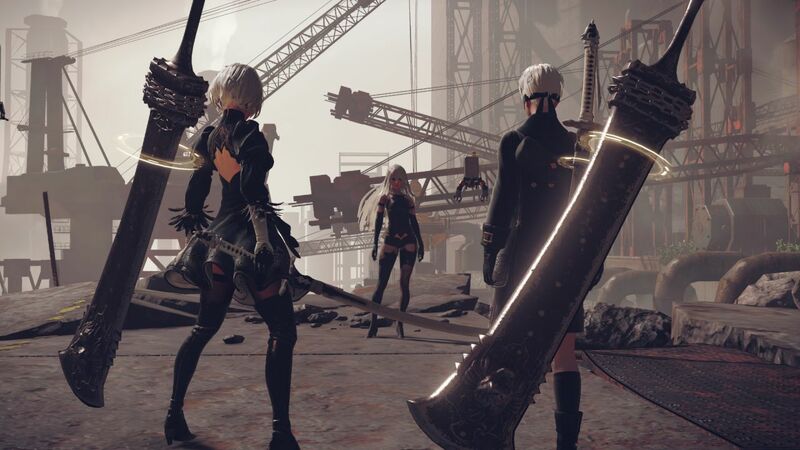 According to DSO Gaming, producer Yosuke Saito said it won’t be long before Nier Automata is released on Steam, but that Square Enix and Platinum games are still thinking about what to do about piracy. Since Saito made a reference to recent games being pirated early in their release window, it looks like the companies had originally planned to use Denuvo for Nier Automata. The DRM solution, once considered nigh on uncrackable, seems to have succumbed to pirates at last, with Resident Evil 7 being cracked in a matter of days. Nier Automata releases in early March for PS4 (no Xbox One port, sorry; the console’s just not popular enough in Japan, Nier Automata’s primary market). It releases this week in Japan, and since the Japanese version of Nier Automata has English language support and the PS4 is region-free, importing is an option. Nier Automata is the sequel to a cult-favourite last-gen game, itself a spin-off of the Drakengard series.